You are viewing HomeAbout UsOur History. Our Hospital. Foundation and Foundation of Chatham-Kent Health Alliance. CKHAF links the community of Chatham-Kent with its local hospital by raising money through philanthropic initiatives. These funds are used in the purchase of equipment and other items in the pursuit of excellence in patient-centred care at the Chatham and Wallaceburg sites of Chatham-Kent Health Alliance. Since 1998, more than $44 million has been raised for local healthcare in Chatham-Kent by CKHAF and its predecessor organizations. 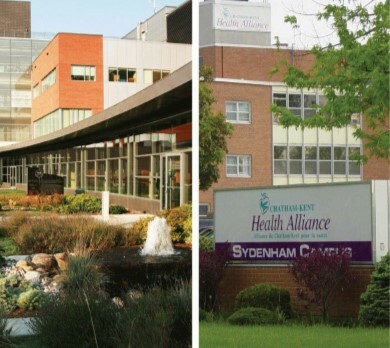 The new corporation of Chatham-Kent Health Alliance (CKHA) was formed on February 1, 2018 through an integration of the former Public General Hospital, St. Joseph’s Hospital and Sydenham District Hospital. Chatham-Kent Health Alliance (CKHA) is a 200+ bed community hospital, equipped with state-of-the-art facilities and technologies. CKHA is committed to core service excellence, top-flight operational performance and to becoming a facility of choice in Southwestern Ontario. With sites in Chatham and Wallaceburg, CKHA is comprised of approximately 1360 compassionate staff, 178 physicians and 300 volunteers who serve the medical needs of 102,000 residents in the Municipality of Chatham-Kent. CKHA is designated a schedule one facility under the Ministry of Health and Long-Term Care and cares for tens of thousands of inpatients, outpatients and emergency patients annually.